Black mulberry trees for sale – Easy plant to grow, with edible fruit also can grow for the ornamental structure of the tree, planting in early winter to mid-summer, better to buy grafted tree male and female plant (or to plant male tree outside of your garden) or another option to start from seeds yet more challenging. Growing information: perennial annual plant, growing hardiness zone: 4-9, water needed – small to average amount, light conditions – full sun to partial shade, height: 3-20 m, 10-67 feet. Blooming in the end of the winter to spring in salver form flowers that appear in white color. Fruit harvesting in spring to summer in cell shaped fruit that appear in purple to black color, fruit can be eaten raw or used for: jam, juice, cakes, dried or leather fruits. 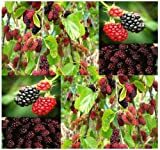 Black mulberry trees for sale – What need to know before buying Black mulberry tree? Edible reason need to taste the fruit, if you can’t check the taste need to check: if it’s from cutting or graft (that there is a graft and it’s in good shape) the trunk that there is no holes, pests and disease free, the soil clean from ants nest or other insect, need to check leaves that there isn’t distortion sometime it can indicate of disease.